Boxing matches are (usually) decided by knockout or decision. However, Timothy Bradley's victory over Manny Pacquiao in June 2012 was highly and widely controversial. CompuBox stats show that Pacquiao landed more punches than Bradley in 10 of 12 rounds. Can promotions/PPVs (ie. politics, media) influence decisions, and/or are there other factors? Below is supplemental information that may help illustrate a point. I found the following judging criteria in this article. The author sources the International Boxing Association Technical & Competition Rules and the World Boxing Association Regulations and Rules Governing World Championship Contests. Before a fighter begins a bout, he must qualify according to the rules of the sanctioning organization. Throughout the course of each round, judges count the number of punches each boxer lands. These punches are divided between "power punches" that land solidly with force, and "glancing punches" such as a light jab, or a punch that slides along the body. Punches with no force, or punches to the arms, are not counted at all. If a fighter has scored more punches at the end of a round, the judges award the round to that fighter. If it's a tie, the win goes to the fighter each judge decides showed the most control, technique or style during the round. A fighter who wins a round receives 10 points for that round. The loser of a round receives 9 or fewer points, based on the margin by which he lost. As a general rule, receiving less than 9 points only happens in the case of a knockdown, penalty point or similar major sign that a fighter was outclassed. After all rounds are fought, the judges total the scores to determine a match total. Whoever has the most points wins. A fighter is considered knocked out if he is knocked down and unable to stand after a 10-second count. If a fighter gets knocked down and stands in time but is knocked down enough times, the referee will stop the match as a technical knockout. Referees will also award a "TKO" if one fighter appears to be no longer able to defend himself or seems to be severely concussed. If knockout does not decide who wins a boxing match, then how do judges come to a "decision" of who wins? I'll try to elaborate on the scoring criteria that you posted. Judges are encouraged to score rounds 10-9 in favour of the boxer who landed the most clean punches in the round. Because of this, the judges should be counting the punches that land and taking note as to the number of these punches which are hard and clean. However, this isn't the only criterion that judges can apply in their scoring of the round. They also look at the quality of the vaguely-termed "ring generalship". Ring generalship is what you noted as "control, technique or style". Now there's little to zero guidance as to how the judges should assess this and it is therefore left wide-open to the interpretation of the individual judges. Some judges will award the round to the "busier" boxer - that is the fighter who threw the most punches whether they were clean or not. For this reason, you'll will often see a boxer finish the round with a flurry of punches so as to impress upon the judges that they had a higher workrate. Some judges look for aggressiveness. This can go against the defensive, counter-punching boxer when they come up against a walk-forward, inside boxer. On the flip-side, some judges like a fighter with a good defence and will award the round to the boxer with the tight defence and good evasive manouvers. As you note, if a fighter completely dominates a round then the judges can score a round at 10-8. A judge will deduct one point for each knockdown. For example, a judge will likely score a round in which one boxer is knocked down twice as a 10-7 round. The knocked-down boxer losing one point for each knockdown and one for being totally dominated. One point can be deducted as a penalty. The referee will indicate to the three judges when a point is to be deducted. This can be done in the event of a low blow or other infringement including not following the referee's instruction. 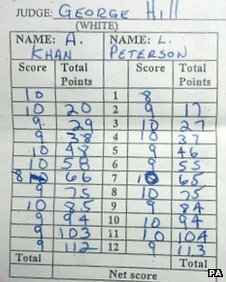 Professional boxing judges are rarely held accountable for their scores. Only in seriously controversial outcomes will you see the relative boxing association call a review. In amateur boxing, such as in the Olympics, all of the punching is computer-recorded and a judge will be called to answer if his assessment widely differs from that of the computer. There is no rulebook for boxing judges. Quite simply they can score the fight how they like. Well, they can, but they shouldn't. 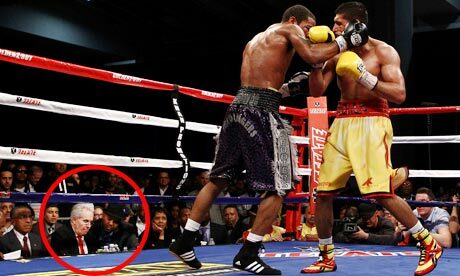 Unfortunately there is a high degree of suspicion surrounding the integrity of boxing. Like other multi-million dollar sports, corruption is probably going on. Amir Khan raised grievance withe the scoring irregularities and an IBF investigation took place. Finally, until the judging becomes regulated, we're going to see more and more of these controversies. How is a surfing contest judged?